I assumed, mainly, that Adventure II would add extra rooms and treasures. That part, certainly, is true. Click on the map to enlarge; rooms marked in blue are new to this version. Please note it is likely incomplete. The new rooms (perhaps inspired by greater storage capacity on whatever computer they were using) include longer descriptions than most of 350-point Adventure. YOU ARE IN A MAGNIFICENTLY ORNATE ROOM THAT LOOKS LIKE A PLACE OF WORSHIP FOR SOME OLD AND MYSTERIOUS RELIGION. THERE ARE EXITS TO THE NORTH, WEST AND EAST AND A SPIRAL STAIRCASE LEADING BOTH UP AND DOWN. THE CEILING OF THIS CHAPEL SEEMS TO BE MADE OF LARGE WOODEN BEAMS. HANGING FROM ONE OF THESE BEAMS IS A THICK ROPE. YOU ARE IN A ROOM THAT APPEARS TO BE A STABLE FOR A FEARSOME ANIMAL. AGAINST ONE WALL IS A BATTERED AND DIRTY TROUGH THAT IS QUITE EMPTY AND ON THE OTHER WALL IS A HUGE HARNESS. BESIDE THE HARNESS IS A SMALL WINDOW THAT OVERLOOKS A COURTYARD. THE COURTYARD IS DESERTED AND SHOWS NO SIGNS OF ANY RECENT ACTIVITY. AT THE FAR END OF THE STABLE IS A WOODEN PARTITION THAT HAS NUMEROUS DENTS AND HOLES IN IT AND YOU CAN SEE THAT IT IS SECURELY FIXED TO THE MASSIVE STONE WALLS SO THAT WHATEVER IS BEHIND IT CANNOT GET OUT. IF YOU LISTEN CAREFULLY YOU CAN HEAR THE MUTED SOUNDS OF GROWLING AND THE SCRATCHING OF CLAWS AGAINST WOOD. THE ONLY EXIT IS THE WAY YOU CAME IN. I’m not sure if the longer descriptions are a feature, really. Nothing mentioned in either of the rooms above can be interacted with. The rule that “interesting scenery objects will at least let you refer to them” was not established yet. The map also includes some instant-death which seems more along the lines of Acheton than Adventure. YOU ARE IN A VERY LOW SLOPING ROOM WHOSE ROOF IS BARELY 3′ FROM THE FLOOR. AT THE LOWER END A TRICKLE OF WATER ENTERS FROM A TUNNEL IN THE WEST AND RUNS DOWN A SHAFT IN THE FLOOR. AT THE UPPER END THE ROOF NEARLY MEETS THE FLOOR TO GIVE A NARROW EXIT. WATER DRIPS FROM THE ROOF MAKING EVERYTHING DAMP AND THE FLOOR SLIPPERY. THERE ARE NO SIGNS THAT ANYONE HAS BEEN THIS WAY BEFORE. YOU ARE IN AN INCLINED SHAFT WHICH STEEPENS AT THIS POINT. THE WALLS ARE COVERED IN A THIN LAYER OF SLIME MAKING IT VERY SLIPPERY. BELOW YOU THE SHAFT IS FILLED WITH DARK WATER WHICH SURGES RHYTHMICALLY. THE SMELL OF THE SEA IS MINGLED WITH AN ALTOGETHER MORE UNPLEASANT ODOUR. YOU HAVE DROWNED HORRIBLY IN A MIXTURE OF SEA-WATER AND SEWAGE! There’s more new features than just extra rooms. EXPLORING IS THIRSTY WORK, YOU MUST SOON TAKE A DRINK OR LIGHTEN YOUR LOAD. Yes, it appears Adventure II has the honor of including the first “hunger puzzle” — thirst puzzle, mind, but functionally equivalent. After enough time without water the player dies. There are a few water sources but it is important to keep the bottle on hand and filled at all times. The message seems to indicate the thirst timer can be slowed down by dropping inventory, but I haven’t experimented enough to know exactly what’s going on. In a way, the reuse of an object from original Adventure for a totally different type of puzzle is what intrigues me most about playing this mod. I just wish it wasn’t a reuse that added a logistical nightmare. The enemies are also somewhat enhanced. The dwarf, for instance, is capable of dropping a “little horn” after death. Blowing the horn doesn’t end well. THE LITTLE HORN EMITS A SURPRISINGLY LOUD SONOROUS NOTE. AS THE NOTE DIES AWAY THE SOUND OF MANY HURRYING FOOTSTEPS BECOME APPARENT. THERE ARE 4 THREATENING LITTLE DWARVES IN THE ROOM WITH YOU. 4 OF THEM THROW KNIVES AT YOU! OUT FROM THE GLOOM JUMPS A LITTLE FIGURE. HE LOOKS AT YOU AND SAYS IN A SURPRISINGLY DEEP VOICE “CHALICE, CHALICE? NOW WHERE DID I PUT THAT CHALICE? IF YOU SHOULD PERCHANCE FIND IT, BE CAREFUL, FOR IT IS SAID TO HAVE STRANGE POWERS”. WITH THAT HE SCURRIES OFF BACK INTO THE GLOOM. THE LIGHT FROM YOUR LAMP DISTURBS AN ENORMOUS OWL WHICH FLIES OFF WITH A FLURRY OF WINGBEATS (AND A LOUD “HOOT”). and a possible extra character only indicated by a shadow. I suspect a thief. (Also possible: random atmosphere message.) The reason why I suspect a thief is the existence of a “Thieves Den” room. By the time I report back I expect I’ll have solved one of the new puzzles. I hope? There are so many variants of the 350-point Crowther and Woods Adventure that it might be considered the first heavily “modded” game. I even have to preface by saying the 350-point version; Don Woods himself made a 430-point version in the mid-90s. 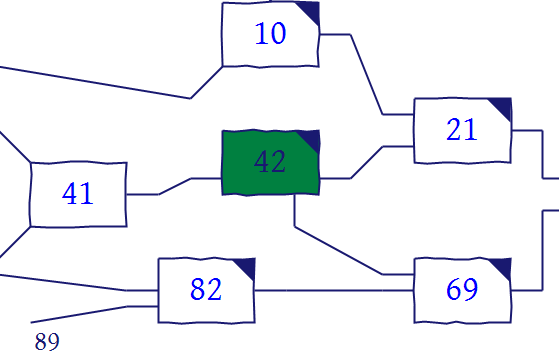 (EDIT: Don Woods made his version in 1978, the 1995 release was just a port into C.) The number of points possible in a particular port is the “identifying marker” for an entire family tree. The “family tree” of Adventure ports. I’m not trying every version — especially since some really are just straight ports — but I think it’s worthwhile to dive into Peter Luckett and Jack Pike’s version, because the original source code is dated 31 Dec 1978. Other sources indicate it was worked on until 1981. However, the 1978 source seems complete, and the availability date makes it the earliest mod of the 350-point version of Adventure. I’m using this port from the original source although there is a z-code version. Some comparison indicates the versions are identical except for normalizing the old-school ALL CAPS style. Replaying when I have truly detailed notes in the form of my old posts about 350-point Adventure feels like I’m playing a find-the-difference puzzle. I’ve taken my original maps as a reference and will poke carefully at each nook and cranny for extra rooms. Outside. 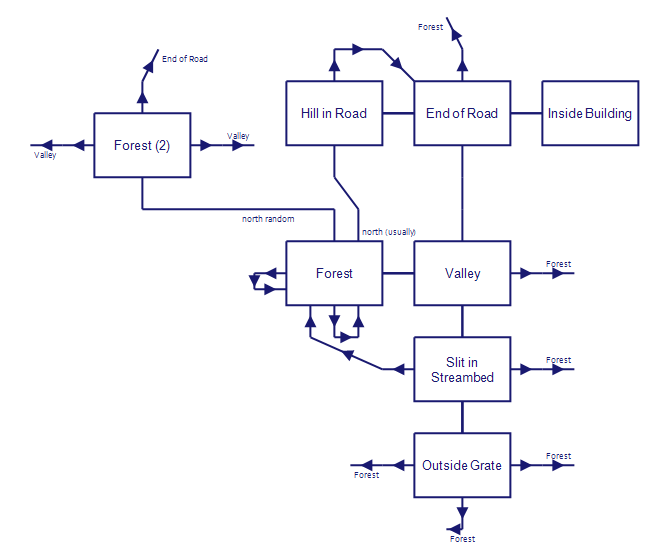 This map goes all the way back to Crowther’s version of Adventure, before Woods came along. YOU HAVE WALKED UP A HILL, STILL IN THE FOREST. THE ROAD SLOPES BACK DOWN THE OTHER SIDE OF THE HILL. THERE IS A BUILDING IN THE DISTANCE. TO THE NORTH LIES A SNOW-CAPPED MOUNTAIN RANGE WITH PEAKS THAT RISE INTO THE SKY. TO THE SOUTH, PARTLY OBSCURED BY A THIN HAZE, LIES A WHITE FORTRESS WITH SEVEN TOWERS. BEYOND THE FORTRESS, SHIMMERING IN THE SUN, THERE SPARKLES A GREAT EXPANSE OF WATER. …but other than that description being elongated, I haven’t found any changes yet. All the Adventures has been continuing apace, but I thought I’d take a moment to mention other places that are useful to visit because they have similar goals. This blog is probably the closest in terms of games played to what I’m doing now — the author has plowed through nearly every TRS-80 game out there. Walkthroughs are included. Oddly, it means I haven’t read it much because I’ve been avoiding spoilers, but I did find their How To Emulate the TRS-80 Model I/III post helpful. This isn’t “ALL the adventures” because it’s skipping text adventures. 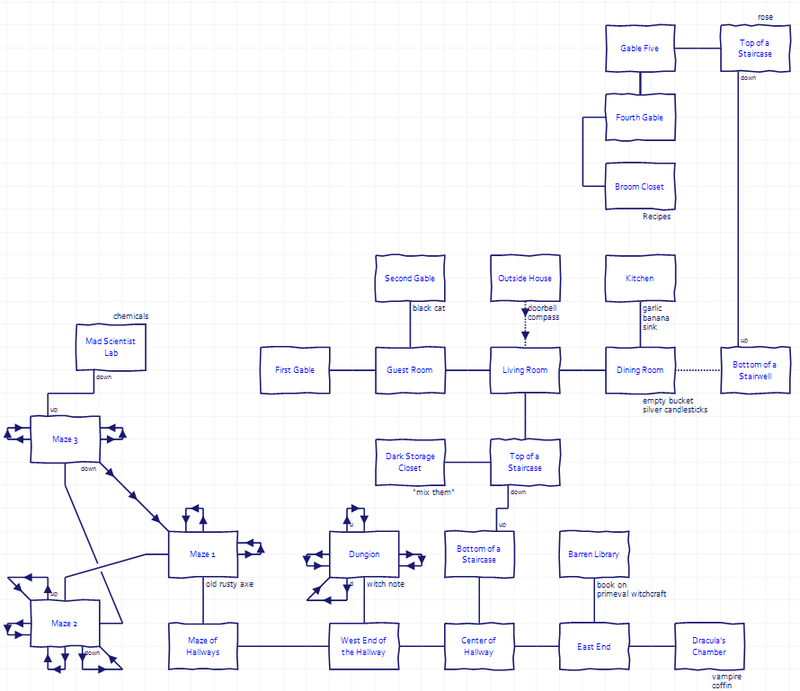 It has a fairly thorough treatment of graphical adventure games that’s sort of a blog version of a Let’s Play. There’s also a rating system, so if you dislike my allergy to applying numerical scores to things you can get your fix over there. This blog is probably the closest cousin to mine in my attempted writing style (small, trenchant observations rather than replication of everything that happened in a particular game) and also covers some very old adventures, like Time Zone. No computer gaming blog anywhere matches Jimmy Maher’s depth of historical research; he’s also surveyed quite a few adventure games through his blog’s history. The folks over here seem to be determined to play (and write walkthroughs for) every classic adventure game, no matter how obscure. 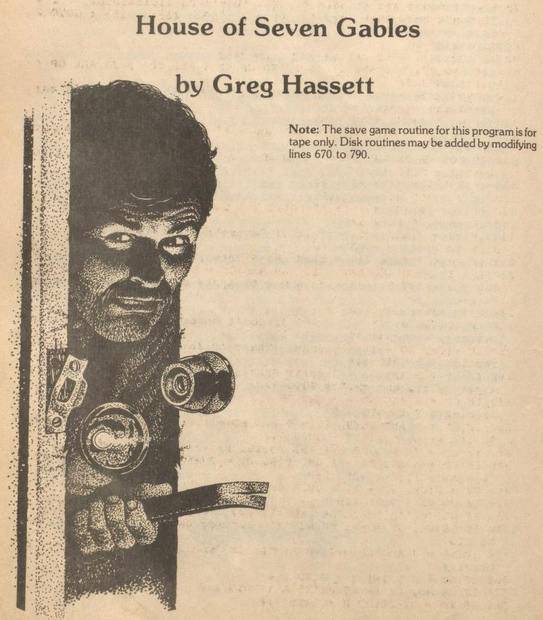 This is a mindboggling comprehensive and well-organized catalog of interactive fiction, with plenty of helpful links. 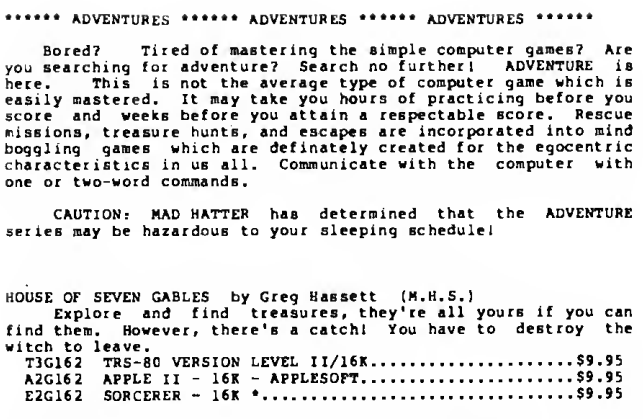 Some of the commercial work from the 1980s seems to be missing, but combined with The Classic Adventures Solution Archive nearly everything is covered. 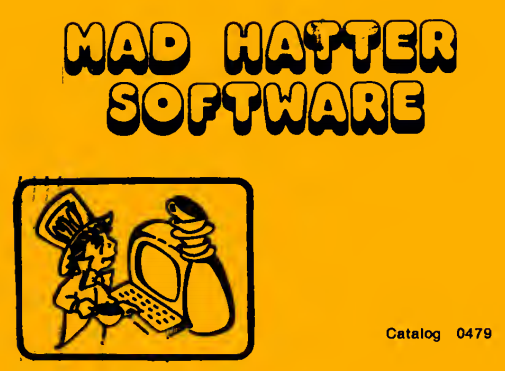 This site has a plethora of original cover art and documentation (both useful in my own quest). The Internet Archive seems to have everything about everything, but I’ve found it most useful for finding old books and computer magazines of the time (including type-in adventures). In a related question, often my writing leans towards short posts like The Stack but occasionally I go a bit longer, like The Adventure Gamer. What do people prefer? From The Captain 80 Book of Basic Adventures by Robert Liddil. I think the cover is supposed to be the hero tentatively entering the haunted house, but it just reminds me of the axe scene from The Shining. Unfortunately, doing so triggers a bug which causes the inventory slot to not be properly reduced, causing inventory capacity to drop by one. This would not be such a problem if more ghouls didn’t drop by unannounced. Finishing the game was truly odd. Clearly there were adventures to collect, but there was no obvious place to put them. I tried the living room in front of the exit, typed SCORE, and noted it went up. That’s wildly meta. There were still plenty of loose ends, but knowing Hassett’s strange red herrings from his last game, I’m not sure if there’s anything to them. 1.) I never did defeat the ghost, but it seemed like it would only appear if I had treasure, so I waited until late in the game before I moved treasures around. Both solutions at the CASA Solution Archive just expect the player to rush through without meeting either the ghost or the ghoul. 2.) Occasionally, for no apparent reason, my score would start dropping by 10 points each turn. I have no idea why this was happening. Negative numbers are possible. 3.) #2 might be related to a black cat which — if you attempt to take it — will teleport somewhere else, where you can attempt the same routine. It doesn’t seem to have any use or relevance other than atmosphere. 4.) The compass starts off as a “shiny new compass” but ends up as a “tarnished old compass” throughout the trip. I don’t know when it happens or if it’s significant in some way. I guess he means “the room next to a gable”? I’M AT THE FIRST GABLE. IT OVERLOOKS A HUGE YARD OF TALL GRASS. There’s two enemies that can pop up randomly: a “ghost” and a “one-eyed ghoul”. The ghost wants a treasure; I’ve found exactly one (silver candlesticks) which I can give to the ghost who will leave me alone. I have yet to defeat the ghoul, so my gameplay consists of wandering around until the ghoul randomly appears, then reloading. Other than the maze, I have solved essentially one puzzle: going east from the dining room. Rather unusually, I figured out what object would work before trying the object. I knew there was an “axe” on the map (I wasn’t holding it — see ghoul reloading) but I wanted to test if it would work, so I tried CHOP DOOR. WITH WHAT, MY BARE HANDS? so even though I couldn’t solve the puzzle right at that moment I knew the use of the axe. There’s no special message for getting all 20 treasures. But it still felt good. Complete spoilers below. Efficiency is important, because there’s a time limit due to the lantern running out (with one refresh from putting a gold coin in a vending machine). There are a number of objects that resolve other problems. I was careful on my winning run not to pick up the puzzle-solving objects until I was ready to solve the puzzle in question. 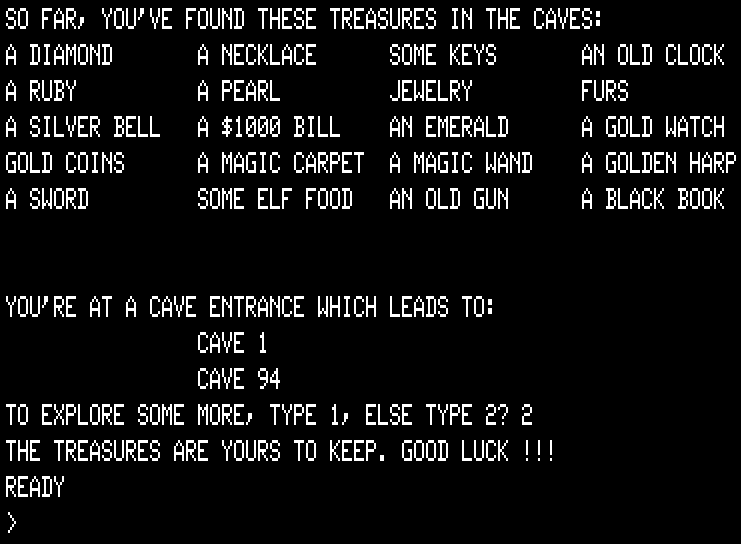 This is not only because of the inventory limit of 3 objects, but that returning to the cave entrance (room 0) will deposit everything being held. Hence, if the gold coins are picked up early (I found them first thing), they need to be marked and ignored until the lantern starts to run low. and a wand that is used to extract a sword from a stone. I was stumped for a while by the dragon, which I presumed needed to be slayed. It turns out the method requires superior firepower. I will leave the “treasure” without comment. Three random things can foul up even the best of plans in Treasure Hunt. 1.) A bat can pick you up and deposit you randomly, causing anything you are carrying to be spread at random on the map. 2.) While being carried, the magic carpet treasure can just fly off on its own; it’s not something you can stop. I’m not even 100% certain the carpet is retrievable; the times I’ve had it happen I never saw it again. 3.) Earthquakes can randomly rejigger where the pits and dragon are. With the lantern time ticking away and every earthquake requiring a re-exploration of the entire map, things are very tense. In my winning playthrough I had found the old gun and was ready to take on the dragon, when a bat swooped down and moved me (and the gun). While trying to find the gun again I experienced three (3!) earthquakes, with the dragon changing location each time. With my lantern running low, trying my best to dodge pits and hoping I didn’t run into another bat, I finally met the dragon in 42 in triumph. The last time I’ve been that tense in a text adventure was the first part of Border Zone, and that was a real-time game. 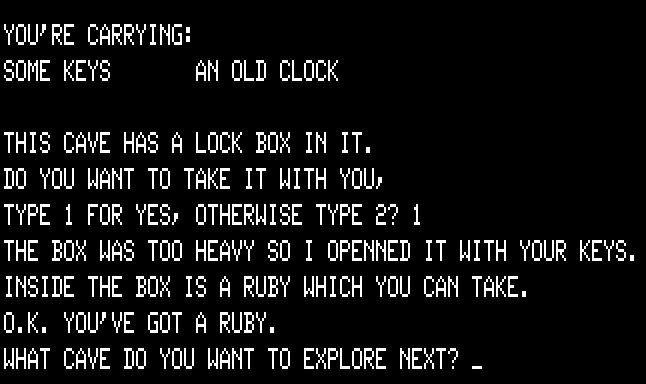 I’m not sure how much of Treasure Hunt I’d want to emulate (it is singularly unfair) but I still appreciate it as a raw experiment.